“T17-Deerhound-armored-car-2“. Licensed under Public domain via Wikimedia Commons. The T17 (named Deerhound by the British) was an armoured car built in the US during World War II. 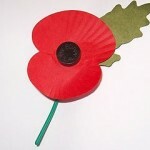 Originally intended for service with both the British and US armies, in the end, neither army adopted it. The 250 vehicles that had been built had their armament (one 37mm gun and two machine guns) removed, and were used by the US Army Military Police Corps in the US. The vehicle was designed by Ford in 1941 in response to a US Army Ordnance requirement for a medium armoured car. It had six wheels, all of which were driven. At the time, the British army was looking for medium and heavy armoured cars for service in North Africa. Production started in late 1942, but tests early the next year showed that the competing T17E1 design from Chevrolet was superior. 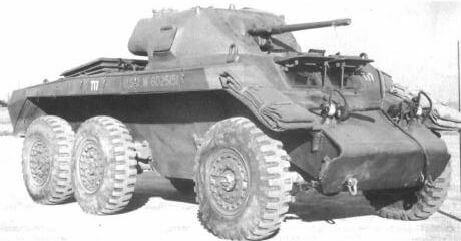 Consequently, Britain decided to buy the T17E1 (which they named the Staghound), and the US army adopted the light M8 Greyhound armoured car.